Cartoon from Friday, September 11th, 2009 - You can follow any responses to this entry through the RSS 2.0 feed. Both comments and pings are currently closed. Sorry, aber Deine Übersetzungen sind schlecht. Ich würde mir an Deiner Stelle mal die Mühe machen, mir mal dict.leo.org anzuschauen. Wenn Du da fragst, “wie würden native speaker dieses oder jenes sagen”, bekommst viel Hilfe. Gefällt mir sonst aber gut, was Du machst! I am just so frustrated and ticked off with the poster right now. How dare anyone discriminate Muslims/Arabs like this? Would you like it if someone posts a picture of you, with your name, and some sick joke like this? You probably will, because you’re a sick and twisted idiot. I wasn`t sure if I should just delete your post because you clearly haven´t understand what the cartoon is about and just want to rant randomly. But I´ve decided to give you a proper response. 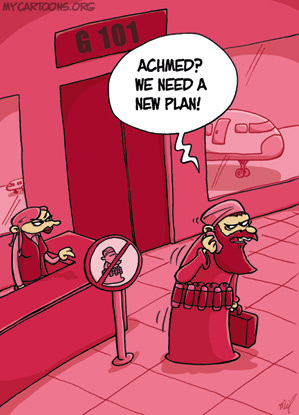 I´m not making fun of arabs/muslims but about terrorism and about rules and the (very human) habit to follow them. The terrorist could`ve been an irish or anyone else but arabic ones are more easily recognized and more popular in our times. If somewhere in the future there`ll be a bunch of catholic priest terrorists running around I will gladly make fun of them and their ways. So if you`re an arab terrorist then you`re probably rightly upset. Also if you`re someone who uses signs and rules for everything or if you follow them no matter what. If you`re none of the above then you need to grow some brains and sense of humor and become a more relaxed human being.